Planning a wedding is tough, there's no denying it. Unless you're a wedding planner, or have an innate talent for planning large events, chances are you're feeling a bit overwhelmed right about now. Given that we're one of the first stops on the wedding checklist, we thought we'd try and help make your life a little bit easier with a new guest blogger series! Every month, we'll be featuring tips, tricks and advice from well-respected wedding industry professionals from across the nation! 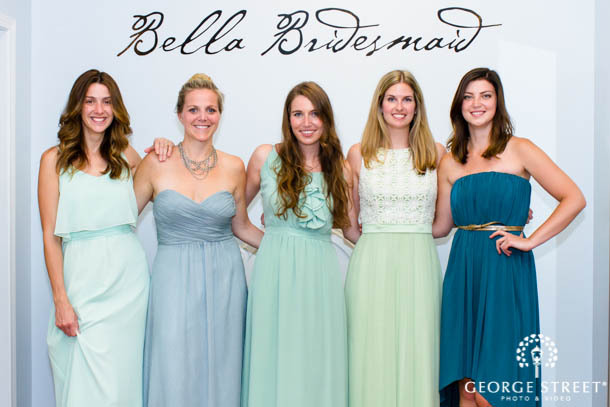 Today's guest, or should we say guests, are some of the fabulous ladies behind Bella Bridesmaid! We've seen countless mismatched bridesmaid dresses this year and these fabulous ladies helped us breakdown the trend and offered some awesome advice on how you can pull off this look for your big day too! 1. We've been seeing a lot of brides trying out the mismatched bridesmaid dress look. Why do you think this trend has taken off this year? 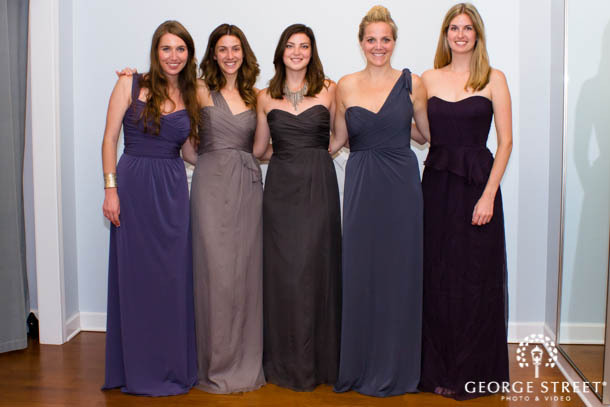 We are lovin' us some mismatched bridesmaid dresses this year! The trend has evolved past letting your bridesmaids choose different necklines in the same color and fabric to a whole new depth of variety. 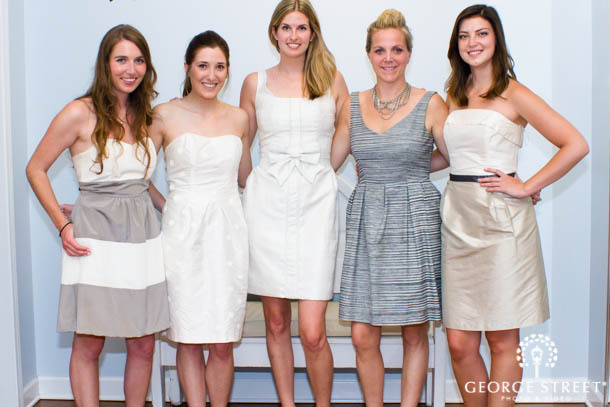 This year our brides have been open to dressing their bridesmaids in different fabrics, colors, and prints -- Oh my! Depending on how far the bride wants to push the envelope, it gives her girls freedom to choose a dress that flatters her specific body type, personal style and budget. 2. What are the pros and cons of incorporating mismatched dresses into your wedding day? 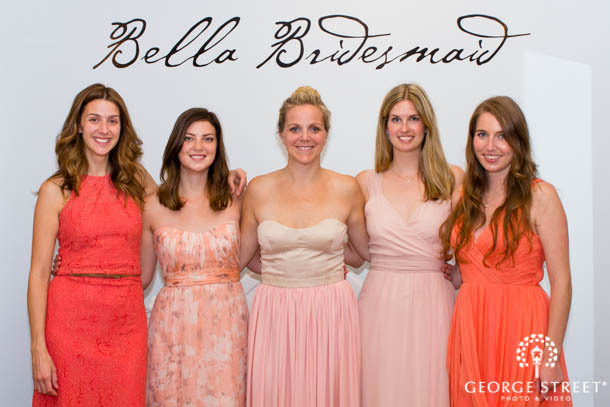 Giving your bridesmaids options is a good thing! It is a great way for the bride to think outside of the box and really show her sense of style and vision for the big day. There are really no cons, but brides may want to mediate the process to ensure no one goes too overboard or strays too far from the color scheme. One great way to make sure everyone stays within your vision is by having them select dresses from one particular line. For example, all the purple-hued gowns below are from the same line so the materials are all the same, the colors all work well together, but the bridesmaids still have freedom to mix-up the top half! 3. When coordinating for mismatched colors, what are some helpful hints to ensure your wedding palette is incorporated in some way? We have been seeing a lot of brides outfit their bridesmaids in mismatched dresses within a similar color scheme - think shades of blush, varied neutrals, or jewel tones. Even if you want to play with textures and prints, generally you want to keep some level of coordination. For this particular photo shoot, we mixed this seasons hottest colors — coral, mint and navy's. Think about it like a girl group -- Beyonce is bootylicious in leather hot pants, Michelle dons a leather corset, and Kelly rocks a leather mini. As Independent Women they still shine, but Destiny's Child works best in harmony! 4. When mixing patterns how do you make sure it won't be too overpowering and distract from the bride "
Mismatching patterns is easy, but making it look good can be tough! The bride should make sure the prints are composed of repeating colors, even if the pattern itself is different. Consider varying the size of the patterns — we matched bold beige and white stripes with small black and white stripes and other simple combinations. Keep the base color consistent and you are good to go. Who is to say a taupe lace dress doesn't blend with a champagne brocade "More power to you for adding in a metallic! 5. Do you have any other recommendations for brides looking to incorporate this trend into their wedding day? Love the idea of showing off your style, but prefer a more classic look for your bridal party? Mix and match jewelry or add some ombre floral shades to their bouquets!